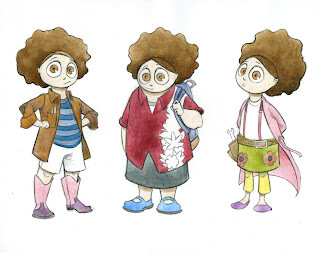 Near the end of September, I posted a set of face concepts for a children's book character named Dainty. One of the faces was selected by the client and I've been working steadily since then on what she'll be wearing. It's been a process, to say the least. I haven't been particularly satisfied with the results until very recently (and there's still some coloring to be done). This post is the rejects. I can't say exactly what the problem was with these, only that the more I looked at them, the more they bothered me. At some point, I think I'll have to address whether or not this is a problem. Here's the issue: dissatisfaction goads me into producing higher quality work. However, I'm still only in the concept phase of this project. 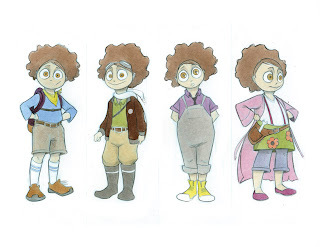 Even a rough sketch should be enough to relate the visual ideas needed to advance decisions about a character. Even those concepts, however, are subject to the same level of scrutiny as a piece ready to go to print. This effort at this level could be seen as being counter productive (or at least inefficient time wise), and it behooves me to find a medium between my own perfectionism and a productive/efficient timeline for concept drawings.